Edward Everett Hale (3 April 1822 – 10 June 1909) was an American author and Unitarian clergyman. Can it be possible that all human sympathies can thrive, and all human powers be exercised, and all human joys increase, if we live with all our might with the thirty or forty people next to us, telegraphing kindly to all other people, to be sure? In proportion as we bothered less about cultivating ourselves, and were willing to spend and be spent for that without us, above us, and before us, life became infinite and this world became heaven. He loved his country as no other man has loved her; but no man deserved less at her hands. Can it be possible that all human sympathies can thrive, and all human powers be exercised, and all human joys increase, if we live with all our might with the thirty or forty people next to us, telegraphing kindly to all other people, to be sure? Can it be possible that our passion for large cities, and large parties, and large theatres, and large churches, develops no faith nor hope nor love which would not find aliment and exercise in a little "world of our own"? The church itself has got to go outside of its own borders and carry the gospel to ev'ry creature, or it is no church of Christ; and any mutual improvement club which thinks that by reading its Shakspearo, or by acting its pretty tableaux, or by having. this or that little reading from Spenser and from Chaucer, it is going to lift itself up into any higher order of culture or life, is wholly mistaken, unless as an essential part of its duty, it goes out into the world, finds those that are falling down, and lifts them up to the majesty of freemen, who are sons of God. Reported in Josiah Hotchkiss Gilbert, Dictionary of Burning Words of Brilliant Writers (1895), p. 150. Statement published in A Year of Beautiful Thoughts‎ (1902) by Jeanie Ashley Bates Greenough, p. 172, Third statement for June 11. This has often been misattributed to Helen Keller in some published works since at least 1980, perhaps because she somewhere quoted it. The Book of Good Cheer : A Little Bundle of Cheery Thoughts‎ (1909) by Edwin Osgood Grover, p. 28; also in Masterpieces of Religious Verse (1948) by James Dalton Morrison, p. 416, where it is titled "Lend a Hand"
Together — one of the most inspiring words in the English language. Coming together is a beginning; keeping together is progress; working together is success. We went on in our quiet way. Life was purer and simpler and less annoyed to us, because constantly, now, we met with near and dear friends whom we had not known a day before, who looked up and not down, looked out and not in, looked forward and not backward, and were ready to lend a hand. Life seemed simpler to them, and it is my belief that to all of us, in proportion as we bothered less about cultivating ourselves, and were willing to spend and be spent for that without us, above us, and before us, life became infinite and this world became heaven. That day the whole world held festival. All schools were dismissed, — all banks and workshops and factories closed, — all "unnecessary labor suspended," as the great salutes and the great chimes came booming out, which announced the agreement of a world of self-forgetting men. That day, do I say? Every day from that day was festival, — century after century. So soon as the world once learned the infinite blessing of Active Love, and stayed it by Faith, and enjoyed it in Hope, there was no danger that the world should unlearn that lesson. You may divide literature into two great classes of books. The smaller class of the two consists of the books written by people who had something to say. They had in life learned something, or seen something, or done something, which they really wanted and needed to tell to other people. They told it. And their writings make, perhaps, a twentieth part of the printed literature of the world. It is the part which contains all that is worth reading. The other nineteen-twentieths make up the other class. That is, do not begin by saying something else, which you think will lead up to what you want to say. I remember, when they tried to teach me to sing, they told me to "think of eight and sing seven." That may be a very good rule for singing, but it is not a good rule for talking, or writing, or any of the other things that I have to do. I advise you to say the thing you want to say. When I began to preach, another of my Nestors said to me, "Edward, I give you one piece of advice. When you have written your sermon, leave off the introduction and leave off the conclusion. The introduction seems to me always written to show that the minister can preach two sermons on one text. Leave that off, then, and it will do for another Sunday. The conclusion is written to apply to the congregation the doctrine of the sermon. But, if your hearers are such fools that they cannot apply the doctrine to themselves, nothing you can say will help them." In this advice was much wisdom. It consists, you see, in advising to begin, at the beginning, and to stop when you have done. I mean the language you are accustomed to use in daily life. "Do you pray for the Senators, Dr. Hale?" someone asked the chaplain. "No, I look at the Senators and pray for the country." Reported in Van Wyck Brooks, New England: Indian Summer, 1865–1915 (1940), p. 418, footnote. Another source states: "The celebrated anecdote... is not so unambiguous as it appears... There is no reason to doubt the authenticity of Hale's reply, but it should be understood within a framework of respect for the senators as well as concern for the country. He knew every one of them personally and regarded them, as he said in his preface to Prayers in The Senate (1904), as 'intelligent men, in very close daily intimacy with each other, in the discharge of a common duty of the greatest importance.'" John R. Adams, Edward Everett Hale (1977), pp. 100–101. 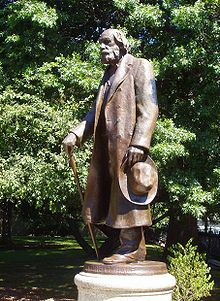 Dr. Edward Everett Hale is one of my very oldest friends. I have known him since I was eight, and my love for him has increased with my years. His wise, tender sympathy has been the support of Miss Sullivan and me in times of trial and sorrow, and his strong hand has helped us over many rough places; and what he has done for us he has done for thousands of those who have difficult tasks to accomplish. He has filled the old skins of dogma with the new wine of love, and shown men what it is to believe, live and be free. What he has taught we have seen beautifully expressed in his own life — love of country, kindness to the least of his brethren, and a sincere desire to live upward and onward. He has been a prophet and an inspirer of men, and a mighty doer of the Word, the friend of all his race — God bless him!